Does anyone else feel like once the holiday season arrives, starting with Thanksgiving, getting ahead is nearly impossible. Last year at this time, I had all my Christmas shopping done, the cards were sent out, and I was 99.9% ready for Christmas and Luke’s arrival. 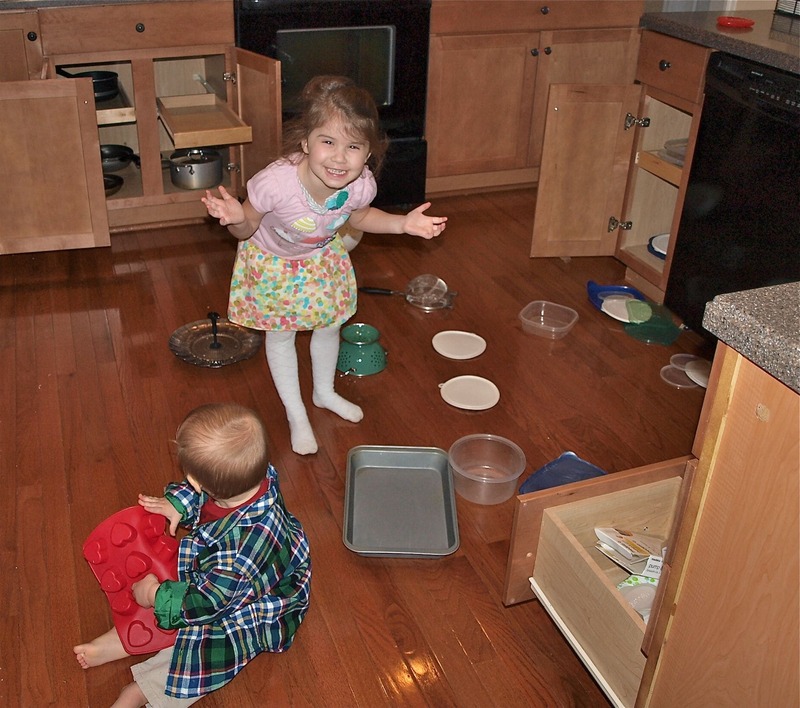 Why, oh why, can’t the nesting instinct just kick in even though I’m not pregnant this year? So, yes, this update is a tad bit late. Better late than never, right? I figure I best get it finished before he turns one (in less than 2 weeks–what?!). As I alluded to in this post, the biggest change around here has been with my diet. It seems Luke’s digestive system has done some maturing in the last few months and is able to handle me eating more foods again! I tested the waters by adding in nuts first. All good. Almost 2 weeks later, I tried wheat. Again, no issues. Waited 2 weeks again and I tried dairy. It had been 9 long months without cheese and I’m not going to lie, I had a cheese pizza for dinner. It may have just been the best cheese pizza I’ve ever eaten. Ever. I held my breath, knowing dairy is usually the toughest for little bellies to handle. That was a week ago now and Luke’s done great with it! I’ve learned, however, that just because you can eat something, doesn’t mean you should. Going 9 months without dairy was actually a blessing. I learned that I don’t need to rely on dairy products to make my food taste good. Upon adding it back into my diet I also learned that I feel a whole lot better without it. I had cheese about once a day for about 5 days in a row and felt sluggish after each meal that had it. It made my stomach hurt and made me gassy. So from here on out, I’m glad to know I won’t have to worry if my vegetables were sauteed in butter at a restaurant, but won’t be eating nearly as much dairy as I did before I had to cut it out. The next food I need to add back in is soy. After such a big failure at 8 months, I am nervous for this one. I’ll give it another week to make sure the dairy is okay, and then I’ll give soy a try. Cross your fingers for me. When it comes to eating, Luke’s a champ. He likes just about all the foods I’ve offered him, and especially likes to eat whatever we’re having for dinner. After Meghan pulled the big switch-a-roo in her eating habits around 2 1/2, I’m not so naive to think this stage is going to last forever. For now, though, I’m just going to enjoy my happy eater. And maybe I’ll get lucky and he’ll naturally be a good eater. Although I know parenting can have some influence on eating habits, overall I still believe good eaters are more born than made. Another big change is that Luke started walking. 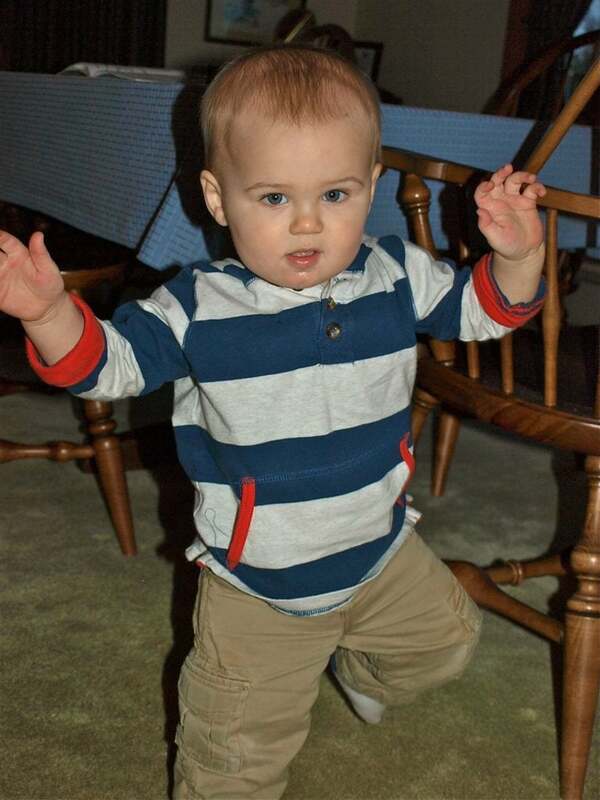 At 10 months he started cautiously taking steps and now he walks from room to room. He just can’t get into the standing position on his own, so when he falls he has to crawl to the nearest chair/wall/table to help him stand up. Walking is definitely his preferred mode of transportation though. I can’t believe how physical this boy is. 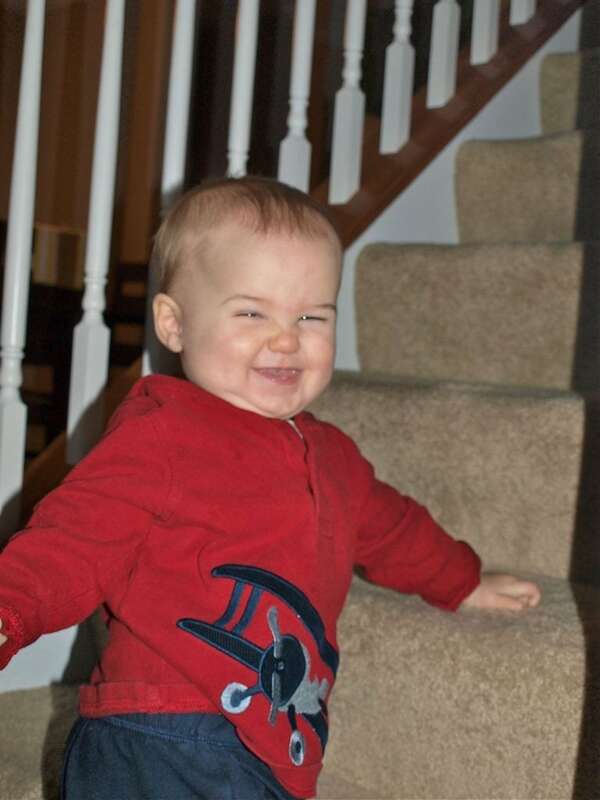 He can easily crawl up and down our full set of stairs. This is the look he gives me when he knows he’s doing something he shouldn’t be. Stinker. He’s starting to climb on other things, as well. When we traveled for Thanksgiving, we stopped at a hotel to break up the 13 hour car ride to my in-laws house. We stayed in a suite with a refrigerator, and as I was packing it with the food I’d brought for our lunches, I had my back turned for a moment. When I turned around, Luke climbed up and onto the shelf of the fridge. It was shocked! I wanted to take a picture, but he could have easily fallen backwards so I couldn’t. This baby is into everything. He likes to play in the kitchen while I’m making lunch. Afterwards, it’s a complete disaster. Meghan thought this was funny. I couldn’t help but laugh. 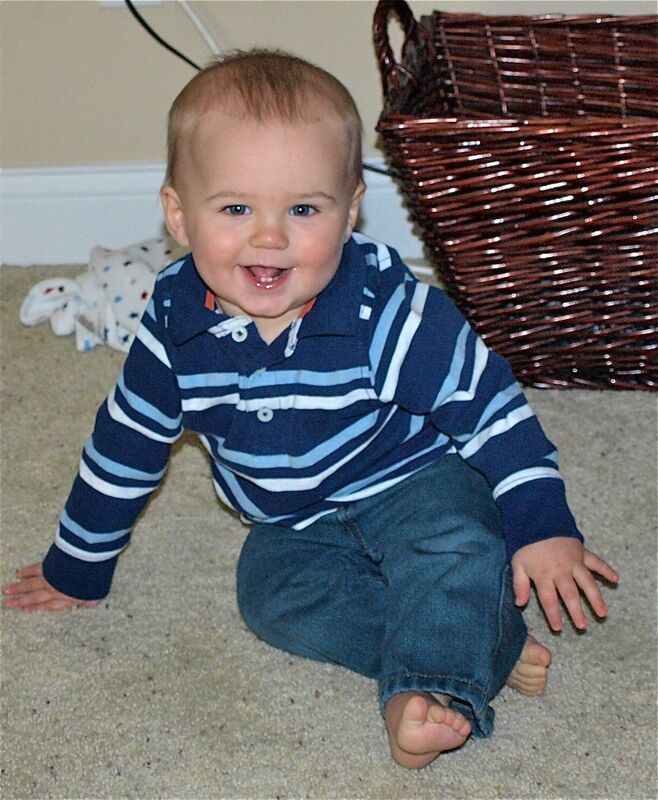 At his 9-month check up, there was a little concern that he hadn’t started babbling yet. Around 10 months we started to hear some sounds and now he babbles and makes all kinds of sounds and noises. No words yet, though. I think he’s just so focused on the physical stuff that he hasn’t gotten around to the verbal yet. Despite not being verbal yet, he can communicate with us very well. I started using sign language with him at 6 months and at 10 months he started signing back. Besides waving hi and bye, he signs “all done” and “more”. We’re working on “drink” (for his water) “milk”, “please”, “help”, “Mommy”, and “Daddy”, too. 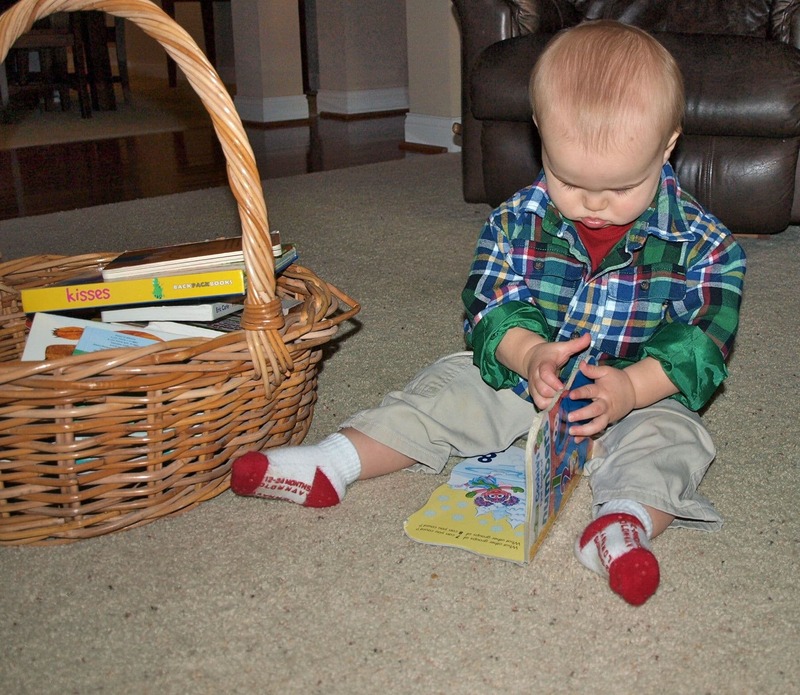 For a baby who is so physical and loves getting into everything, Luke surprisingly loves to look at books, too. He’ll sit and happily page through books or let me read to him for a good chunk of time. His favorite books right now are Where is Baby’s Belly Button and Goodnight Gorilla. Speaking of good nights, let’s talk about sleep. Oh, sleep. A distant dream that I vaguely remember enjoying at one time. From about 9 1/2 months until 11 months was a loooooong 6 weeks. During that time Luke got 4 teeth, each one back-to-back. His night sleep suffered. I guess there are some babies out there who are unaffected by teething. Apparently Luke is not one of them. During that time I’d have to go into his room 2-4 times a night. The first time he’d wake up, I would feed him. I’d put him back down and he’d just be…awake. Not crying, but making noise and keeping me awake. He’d stay awake for an hour, then start crying again. I didn’t know what to do to help him. It was seriously exhausting. Things aren’t quite as bad right now, but he’s still not sleeping through the night and I never know what to expect each night. Every night I pray that God will bless both Luke and me with the gift of a full night’s sleep. I think He’s giving me a lesson in patience. Luke’s saving grace with sleep is naps. He takes two solid naps a day that I can pretty much always count on. Now that I type this I just know something’s going to change. Knock on wood for me, will you? I’m going to make this already-wordy post a little wordier by adding a little bit about me. I’m still feeling good at almost a year postpartum. After my last bout with mastitis, and then the holidays coming, I’ve had a hard time getting back into my regular exercise routine. I’ve been sporadically fitting a workout in here and there, but I’m not where I want to be. I guess that’s what New Year’s resolutions are for, right? My next and last baby/postpartum update will be for ONE YEAR. I can’t believe my baby boy is going to be a year old. Thanks for letting me share our journey with you. Awww, no more baby updates?? 🙁 I love see these posts! So glad Luke is doing better with food and that you were able to eat pizza. Yum, yum! I really struggled with how to spell it but in the end I tried to keep it simple. Most people do need me to say it and then they are able to spell it easily. Time does fly, even for those of us who don’t have little ones yet. I started reading your blog around the time you were about to pop so I can’t believe it’s been a year either! I enjoyed reading your update on dairy. As a vegan, when I cut it out I felt “lighter” and much less bloated almost immediately. I never realized how much havoc it was wreaking on me. Last week I must have accidentally eaten something with dairy or eggs, and nasty stomach aches and gassiness ensued. Not fun! Luke looks like a very healthy, happy baby boy! 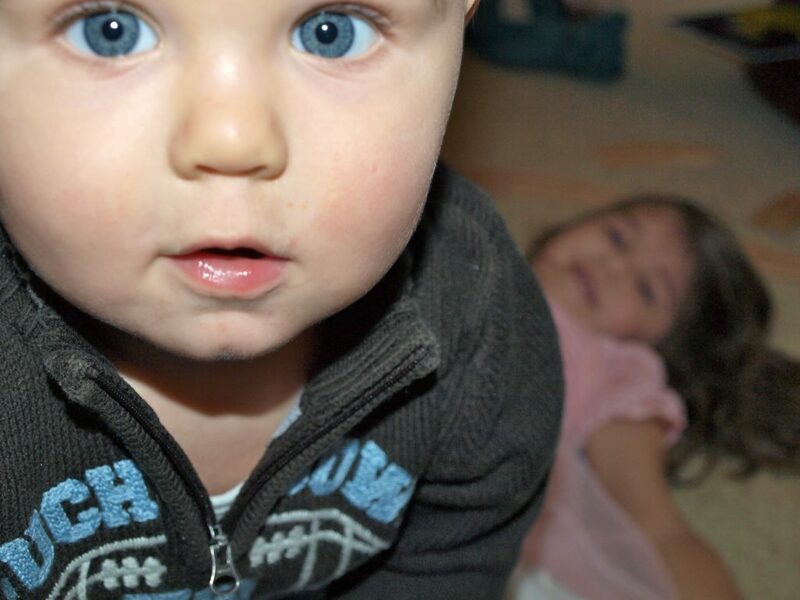 Love those baby blues. How much does he weigh now? I’m not sure since we haven’t had an official weigh in since his 9 month appointment, but I’m guessing he’s around 26 pounds. I’ll find out in a few weeks for sure. He’s a big boy! I seem to do okay with eggs, but when I’ve eaten cheese and butter the bloated/gassy feeling has been very noticeable. Definitely doesn’t make me want to even try to feed that stuff to Luke! What a busy little guy!! I love it! My son was the same way, climbing on everything, into everything… It is so exhausting, but so much fun especially when they get older 🙂 I’m so glad to hear how much better he’s doing with different foods! Yay! Hello! Just wanted to know when you tried introducing foods back into your diet- sounds like between 8-10 months, with a couple weeks between foods, right? I am nursing my daughter (6 months) and am dairy, soy, wheat, nut/peanut/coconut and chocolate free. Looking forward to getting some foods back into my diet, but of course I am scared of how she will feel if we have a “fail.” We have a vacation coming up, and eating out of town would be easier if we had fewer restrictions. Since Luke was eating solid foods while you were introducing foods back into your diet, did you ever have confusion about whether a reaction was to something he had eaten or something you had eaten? Also, after reading the comments, I am just so curious- how do you pronounce your name? Thanks for your input- really enjoy your blog. Hi Betsy–I first tried to introduce soy at 8 months. I had one soy latte and he had a strong reaction (mucous in stools, explosive poops, terrible gas, and one very sleepless night). After that I waited until 11 months to introduce anything else. I started with wheat, then did nuts, then dairy. I’ve only recently had limited soy, like soy lecithin in chocolate. I was really only feeding Luke fruits, vegetables, beans,and some oats when I started adding things back into my diet, so I was pretty confident any reactions would be from what I was eating. I also didn’t introduce any new things into his diet while I was trialing a food. I’ve recently (he’s 14, almost 15 months now) started to try to get give him different foods, and the results have been mixed. I plan to do a full post with an update after his 15 month check up on Monday. Hi Maryea. Thanks so much for your input. So far, starting solids with Grace has been a little rocky, so I think I’ll hold off trialing new foods in my diet. I nursed my older kids for 2 years, and would like to do the same for Grace, but thinking about continuing the restrictive diet for another year and a half is daunting! Hopefully she’ll be able to tolerate more foods at some point. I’ll look forward to your post about feeding after Luke’s check-up!